Recycling is important; I'd always wanted to recycle....even as a kid. I've always been concerned about the amount of trash our nation and world produces too. So, as soon as recycling became easy and convenient, I did it. I was no pioneer; I didn't recycle until our city provided nice, blue plastic bins. Fortunately, that happened years and years ago. It happened because recycling was so important to a few unique individuals that their passion took action. One of those zealous advocates is Mary Pat Baldauf, Columbia's Sustainability Facilitator. Mary Pat is a pioneer, a real role model. 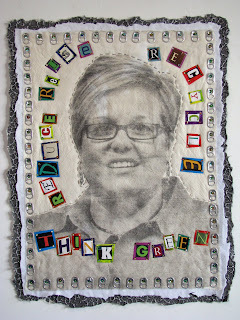 Recycling isn't just her job; it is her passion, her hobby, her business, and her lifestyle...always has been! Everywhere Mary Pat goes she spreads cheer. 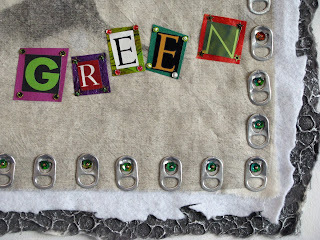 She makes recycling FUN....because it is FUN! Because of her personal efforts, Columbia is a greener city than many other, even larger cities across the nation. Mary Pat also has an on-line business called Trashformations....with all sorts of whimsical, gifts, home accessories, and jewelry made from recycled materials. She organizes events to spread the news: Recycling is fun, easy, and the responsible thing to do! Yet, recycling is still a choice. Many people don't make this decision (but they haven't met Mary Pat yet!) 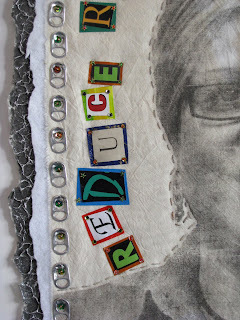 I am very proud to include Mary Pat's personal choice for a better future in The Decision Portraits Series. When I asked Mary Pat to pose, she prepared a list of possible words for the portrait. (Mary Pat is truly professional and a sincerely wonderful person with whom to work!) I could only use two of the phrases, but the list is worth posting! Here it is! I talk trash and get paid for it. Don't throw it all away....RECYCLE! I turn trash into treasures. You'll produce about 120,450 pounds of garbage in your lifetime. Recycle. One is not enough: Recycle. I was recycling before recycling was cool. Sustainabiltity is not a four letter word. Is it hot out here or is it just global warming? Trees don't grow on money either. Stop using the earth as your trash can. Now that's my kind of lady. 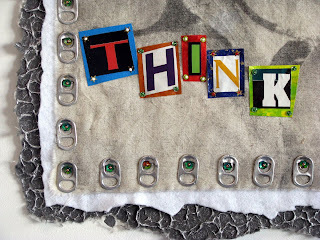 I love the use of the drink can tabs in the border. This is great, I love that woman. After seeing this post, I just got an idea. Allthough where I live, cycling is pretty ordinary, I heard that in America it is quite different and having no car but doing everything by bike (and public transportation) by choice is something you have to be really committed to. Really a great addition. It's colorful and bright and, like you said, fun. Even in countries where recycling is normal, not all of us do a really good job of it, I'm sorry to say.